Getting your figure back after your baby is born is never easy, especially when you can’t take your baby to the gym. Exercising outside with baby is the perfect solution, and with other mums - it can be fun too! Legs Bums & Mums, started by Local Mums' post-natal fitness expert Jo Cullen has been taken over by our very own Maria Holley, Fitness Editor of Local Mums Online! "I'm thrilled to be taking over this prestigious and successful fitness company," says Maria, who attended Jo Cullen’s classes at Westcroft leisure centre herself when she first had her babies. "Mums want to exercise but childcare is expensive," explains Maria. 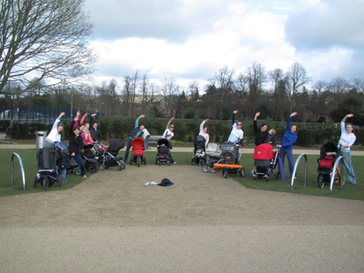 "Legs Bums & Mums�is�a good opportunity to meet other local mums and give your baby some fresh air while getting back in shape." "When you have just had a baby, you are pretty exhausted," adds Maria. "One hour of exercise in the fresh air will make you feel so much better and help you to get through the day." "I feel health and fitness has really changed my life in a very positive way," says Maria. "I am passionate about helping others to achieve their fitness goals." Maria also uses resistance bands (of varying strengths) instead of heavy weights, which she says is a more suitable approach to tone and strengthen muscles after giving birth. Maria is a level 3 personal trainer with qualifications in ante and post natal fitness, sports conditioning, outdoor fitness, nutrition for exercise and exercise to music. She is currently taking bookings for Buggy Sessions in Queen's Park, Caterham; Beddington Park, Wallington and Priory Park, Reigate and your first session is free.